Slightly adapted from a BBC Good Food recipe, this blood orange blossom and pomegrate cake is incredibly moist and delicious. 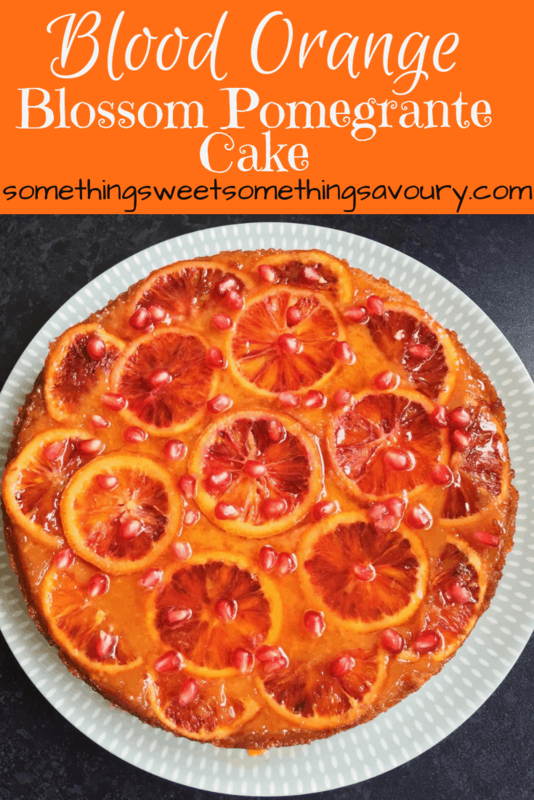 It’s the perfect cake to celebrate blood orange season! I have such a thing for blood oranges at the moment. I’ve been eating them in salads, finding excuses to bake with them and eating them just as they are. The juices drip down my front and on more than one occasion I have unknowingly walked around in public with a great big pinky-red stain down my top. Oops. 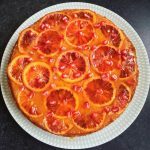 I’ve tried a few blood orange cakes – such as this blood orange syrup loaf cake I made last year – but the one I’m sharing with you today is my new favourite. The honey soaked orange slices that adorn the top of the cake look so beautiful it is a cake worthy of the name showstopper but with none of the hard work. It’s quite similar to a Nigella Lawson cake I used to make a few years ago in that a whole cooked orange is pureed and added to the cake batter. This method produces a really moist, flavourful cake with an unusual but lovely texture. Annoyingly the blood oranges I used for this cake weren’t the vivid colour I was looking for – and of course it was sod’s law that the ones I bought the week after I made this cake were really vibrant and red! I linked this recipe over at A Mummy Too for Recipe of the week. 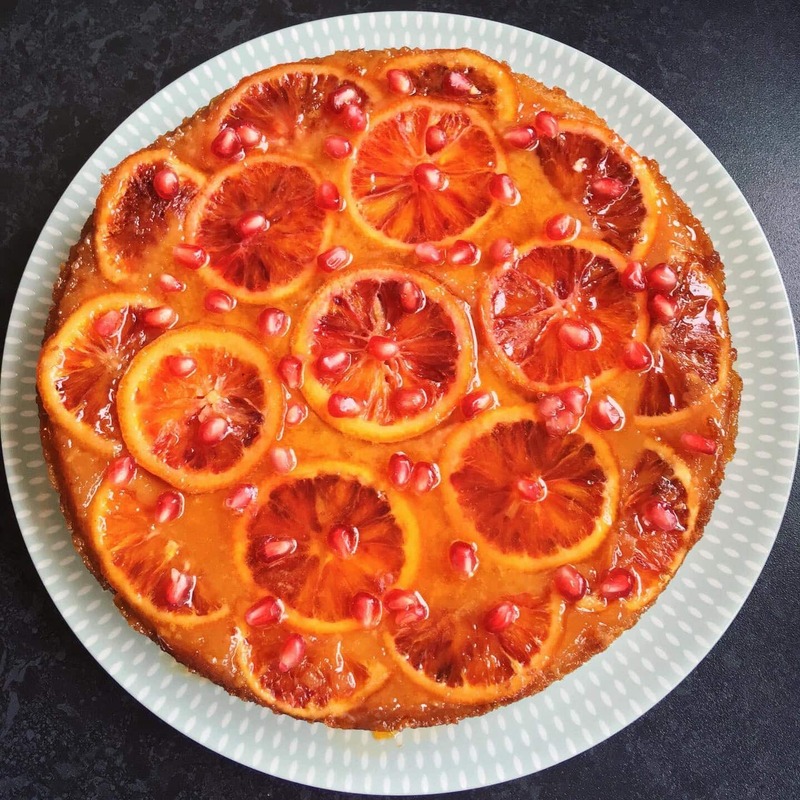 Adapted from "Blood orange blossom and pomegranate cake" by BBC Good Food Magazine February 2015, this cake is made incredibly moist and delicious by adding a whole cooked orange to the batter. Place one of the oranges in a pan and cover with water. Bring to the boil, turn down the heat and simmer for 40 minutes or until the orange is really soft. Remove from the oven and once it has cooled a little, cut in half and remove the seeds. Grease a 22cm round tin with butter. Drizzle 2 tbsp of honey over the base of the tin, then slice the remaining two oranges quite thinly and arrange in the tin. Puree the cooked orange in a food processor. Beat together the soft butter, sugar, flour, almonds, baking powder, eggs, 1 tbsp orange blossom water and Greek yoghurt until the batter is smooth. Stir in the pureed orange and pour the orange flecked batter into the tin, being careful not to dislodge the orange slices. Bake for 55-60 minutes until a skewer inserted in the middle comes out clean. Cool the cake in the tin for 10 minutes, then turn upside down on a plate. Place the ingredients in a small pan. Slowly bring to the boil, turn down the heat and allow the mixture to bubble for a few minutes until it becomes syrupy. Pour a little of this syrup over the cake but save the rest for serving later with Greek Yoghurt or vanilla ice cream. Sprinkle the pomegrate seeds liberally over the cake. looks delicious!! I bought a few (very pricey!!!) oranges at my store today, I think this is how I am going to use them! Definitely saving this recipe for a future tea party! Goodness, that looks tasty. Thanks – it really is a lovely cake! So yummmy!!! I’ll have to do it! So yummy, I like it!